The better insulated your home is, the less likely you are to have cold drafts and air leaks. The more warm air you keep from escaping, the less your furnace will have to work. One area that you should place emphasis on is the attic if you have one. Warm air rises making this a prime escape spot for heat. Sealing holes that are letting air in or out may help you reduce how much you are using your heater or air conditioner. Tinting your windows can help keep the heat out during the summer months, reducing the amount you’ll need to use your air conditioner. Make sure your dishwasher and washing machine are at full capacity every time you use them. Also, unplug any appliances you aren’t using. Even if they are turned off, they may still be using power. Replace your incandescent light bulbs with the much more efficient compact fluorescent lamps. According to Consumer Reports, you can save about $57 over the life of a bulb by making the switch. 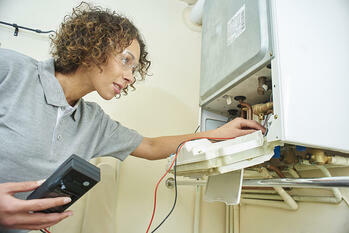 Along with your furnace, consider installing a new programmable thermostat. This can be scheduled to turn on and off based on when people are at home. There are federal tax incentives available to those who install energy efficient upgrades into their home. A full breakdown of incentives available in Utah can be found HERE.